Welcome to the Tobacco Valley Board of History! Learn about our efforts in preserving local history and how you can enjoy this beautiful space. Everyone is welcome to stop by and enjoy our facilities. You also can become a member, volunteer or make donations. Join our efforts to help our northwest Montana communities grow and improve. Follow our blog to learn about upcoming events. The Tobacco Valley Board of History is a not-for-profit, volunteer organization, dedicated to preserving our community's history and heritage. Chartered in 1971, the Board of History preserves historic information, buildings, and culture. Our mission is to encourage and act on the publication of historic works, restore and preserve historic buildings, artifacts and monuments in our possession, and retain a living link with the past cultural through interpretation, display and programs at the Historical Village. The Historical Village is a collection of historic buildings and artifacts from the Tobacco Valley area. Our properties include ten structures and their contents, which are maintained and administered by volunteer workers, fundraisers and donations. This unique collection of structures and artifacts was originally made possible by private donations and the Lincoln Electric Cooperative. All buildings and artifacts on the site date back to the 1880s and 1920s. These include a general store, schoolhouse, library, church, two log cabins, a hand-hewn house, railway depot, caboose, and fire tower. Some were rescued during the Libby Dam construction era in the late 1960s. Interpreters are on site and all buildings are open to the public from Memorial Day until Labor Day. The Fewkes General Store, which serves as a museum, is also the depository for a collection of archival materials donated by organizations and residents of the Tobacco Valley. This includes an extensive, cataloged and registered archive of written and photographic materials. These materials are available for research at a minimal fee. 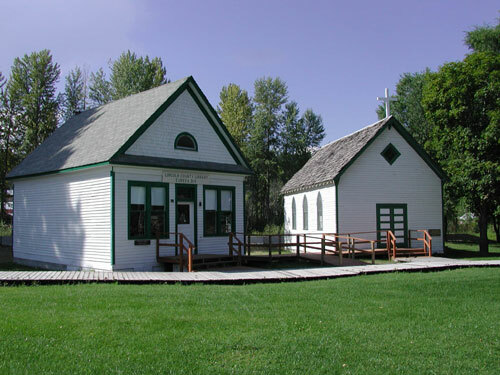 Old Eureka Library and "Our Lady of Perpetual Mercy Church"
Volunteers offer interpretative and public programs, conduct research, and create exhibits from our extensive collection. The Historical Village is also a source of visitor information for the entire Tobacco Valley. The grounds are available for rental upon request. The grounds also feature a native plant display designed to teach the value and importance of native plants and animals to Native Americans and early settlers in the area. The Tobacco Valley Board of History does fundraising to maintain the Historical Village and its contents. Some activities include rummage and book sales and an annual Christmas bazaar. A hand-quilting group is an important part of the Board of History. They quilt in the old school house every Friday from Labor Day to Memorial Day to raise funds for the Historical Village. If you have a quilt top you would like hand quilted or to purchase a quilt, let us know. Anyone interested in quilting with the group is welcome to stop by on Fridays from 10am-3pm. If you would like to make a donation or become a member of the Tobacco Valley Board of History, contact Dianne Linn. The grounds at the Historical Village are open year-round and include a playground and picnic tables. All the buildings including the museum are open Memorial Day to Labor Day from 1pm - 5pm. 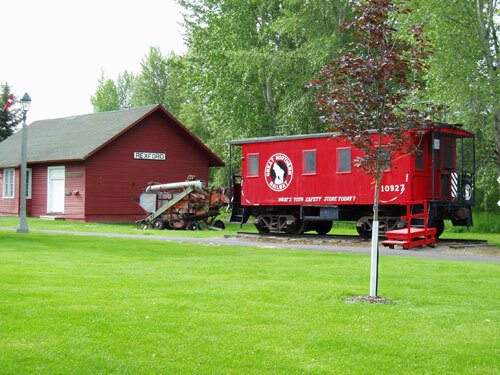 Annual events held at the village include Rendezvous, Eureka Montana Quilt Show and Shakespeare in the Park. If you are interested in renting the grounds for an event, contact Rita Collins. Download Grounds Use Policy.